The more you know, the smarter your marketing decisions. It only makes sense to do some market research before spending precious dollars on marketing tactics. The “big guys” are doing it all the time. We suggest you do too. We help clients make better choices about their marketing spending. Take a look at our research on website design trends. While developing the concept and brand for Bistro To Go and pre-financing, RS&A researched the local consumer market and the national prepared foods market. One result was the compilation of demographic and economic data into a user-friendly market study that other local businesses and developers could also use. This and other online research also went into the business plan, which funders described as one of the best they had ever seen. Based on the research, the Bistro marketing and PR strategy for the launch used lower cost marketing tactics to create a local buzz. While building a stronger and more consistent brand and messaging for this physician, RS&A analyzed local and national competitors’ websites for features and marketing strategies. While the client chose not to upgrade her website at the time, the research revealed some shortcomings in her site compared to competitors. 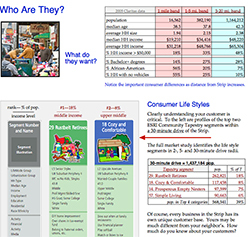 To bring the market research down to “street level” at an affordable price, a business association and Randy created the Marketing Snapshot process in 2007 to provide custom analysis and recommendations for individual businesses. They include extensive Internet research. 30+ participants—now including 3 nonprofits—have evaluated the results very highly, including as a major step toward a strategic marketing plan. Note: Snapshots have been endorsed and funded by the URA’s Mainstreets Pittsburgh program in the Strip District and Bloomfield. Neighbors in the Strip needed to consolidate a lot of research studies as part of its new business plan. 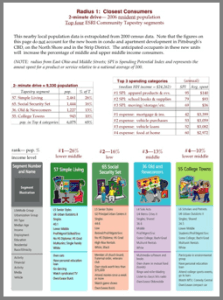 RS&A produced a 32-page strategy report, including new user friendly demographic and economic data. This document provides solid data and strategies to businesses and potential developers. To encourage the Strip merchants and other businesses to read the big study or to factor research into their marketing efforts, RS&A created a 4-page ‘teaser’ brochure. 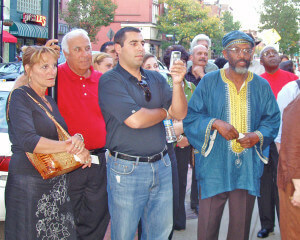 Combining useful data with low cost marketing and Main Streets tips, the piece was popular with the merchants. This fractional vacation home developer wanted a variation on a Snapshot, so RS&A produced a compact study of the national marketplace for second homes. 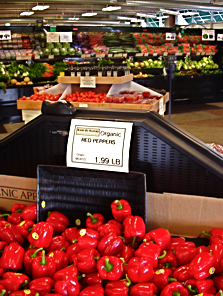 The research uncovered a survey of the upscale market by American Affluence Research Center. It clearly showed a lack of understanding of the developer’s “fractional” ownership in the target market, which led to reshaping marketing strategies.. The vision to create a public market in the Strip District required serious “number crunching” and market research before seeking funding. RS&A worked closely with a development committee to produce the study needed to take the project to the next level. Again, a user friendly executive summary document was produced to reach a larger audience with the message. Example 7a. Randy also performed an annual performance evaluation for the U.S. Health and Human Services department for a grant to the market hall project. What an owner thinks his brand is and what customers think can be two different things. 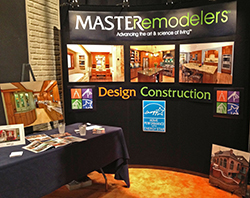 RS&A developed a simple, low cost model to quickly assess Master Remodeler‘s brand. It was adapted from an insightful article [PDF] that came via MarketingProfs.com called “Keeping the Brand Healthy: The Annual Brand Checkup.” The whole process, including 13 interviews, took less than two weeks and gave the client greater clarity about their brand perception in the minds of their clients. At the end of a four month campaign to drive more customers into several of Pittsburgh’s Mainstreets districts, RS&A conducted a multifaceted evaluation of the campaign. One important finding of the study was the critical role of women in consumer decisions. This was revealed by by data from a contest built into the campaign. This evaluation also included campaign website activity, participating business comments and more. We’ll help you make smarter, more informed marketing choices. Call 412-322-9720 or email.